A motivational message for the kids out there learning to ride. In November last year I came across a NY Times article about cycle lanes, and thus cycling, in NYC facing a “backlash” from some drivers, business owners, and pedestrians. Apparently in the last four years NYC has had more than 250 miles of traffic lanes dedicated to bicycles and several laws intended to promote cycling have been passed. Most of this progress can be attributed to cycling advocates and the Transportation Alternatives (a bit like Transport for London but with bigger scope). Other articles in November highlighted the issue, such as from the Village Voice, Gothamist, and NY Daily News. There have also been many articles before and since then, but November seemed to be primetime since the City Council held a hearing on Dec 9th to address balancing the needs of cyclists with those of other road users. “New York’s backing of bicycling has come at a price. Specifically, the ire of angry drivers who think bike lanes impede traffic and slow them down and even residents who simply think bike lanes are ‘ugly.’…But according to the D.O.T.’s [Department of Transportation] own reports, new bike lanes increase pedestrian safety and reduce accidents. The installation of bike lanes requires narrowing parts of the road designated for cars, forcing motorists to drive more slowly, pay more attention, and culminating in “a traffic calming effect.” The debate has also prompted bike riders and pedestrians to submit demands, such as bike lanes to be extended all the way up to 125th Street, and to follow through on plans for pedestrian islands and protected bike lanes on Manhattan’s First and Second avenues. Wow. Like London, NYC has seen similar growth in cycling numbers (109% in NYC since 2006 and 91 to 117% in London since 2000)[¹][² and ³], yet unlike London, there have been hundreds of miles of bike lanes concurrent with that increase (and I’m not counting Cycle Superhighways). Echoing the words of Chris Peck, the CTC’s policy co-ordinator, the growth of cycling should also see the growth of bike lanes and other cycling infrastructure, such as police that actually give a damn when you’ve been in an accident/had your bike stolen or safer and bigger bike lanes, not just more cycle parking stands. Nonetheless, big ups to cyclists in NYC defending their right to a safe ride! 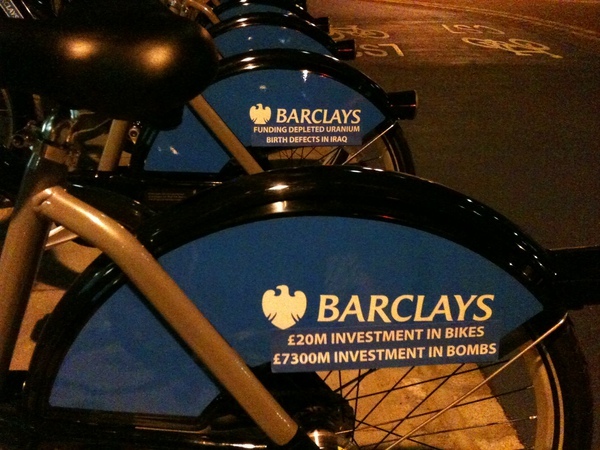 As a continuation of the entry on the Bike Hire Scheme pre-debut, we’re including some more commentary we find and how people have reacted to the Boris Bike post-debut. This will be updated whenever we find something relevant to the Boris Bike and, at times, transport strategies for London.